Traditional pumpkin carving designs are a scary prospect for young ones on a couple of levels, so here's our roundup of 13 pumpkin decorating ideas that have child-friendly themes and skill levels, and that are low on the carving requirements. (Completely contrary to my own advice, of course, my Star Wars-mad family will be attempting this ambitious project!) However, even if you don't have to carve your pumpkin, it's still worth removing the seeds before you decorate to make yummy, scrummy pumpkin seed snacks for healthy fall treats. Read on for 13 ways your kids can decorate a pumpkin -- and feel SO very proud of their fantastic displays to perch on the porch! 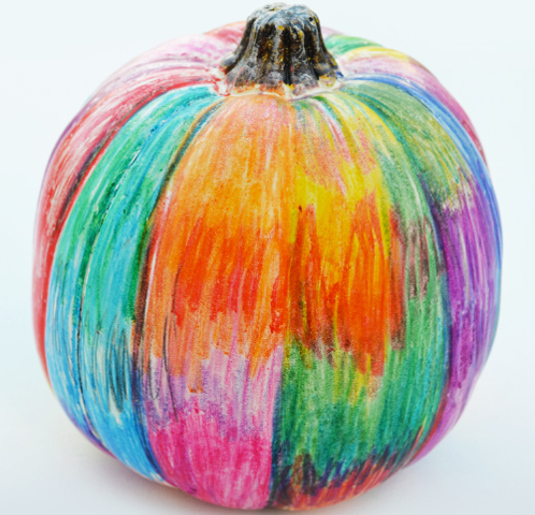 This crayon scribble pumpkin from The Swell Designer is bright, fun, easy and adaptable. The colors standout best if you use a white pumpkin as a base for this project, but you could experiment with complementary tones if you used a light grey or yellow pumpkin too. 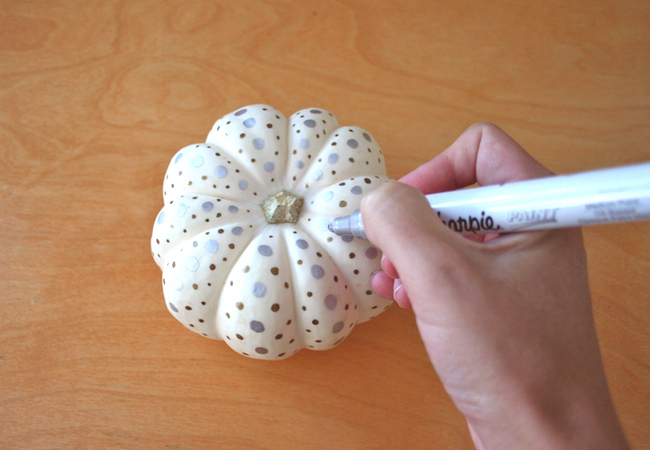 RELATED | 5 Unique Ways To Decorate Your Pumpkin – No Carving Required! 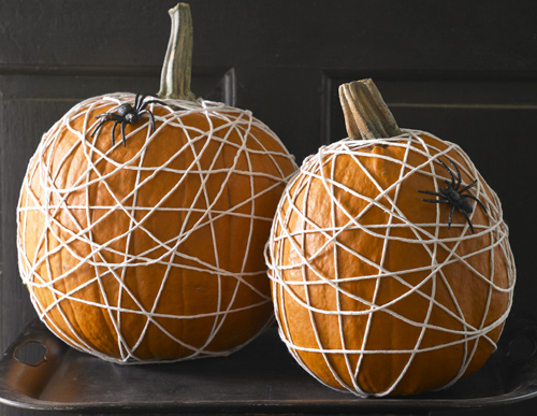 This is another simple, yet oh-so-effective pumpkin decorating idea. As with this project from Sweet Paul, you can simply buy rolls of colored dot stickers from the stationery store. Or you can get a bit more glam and cut out textured glittered adhesive pieces with a circle hole punch, as in another beautiful project from The SoHo. 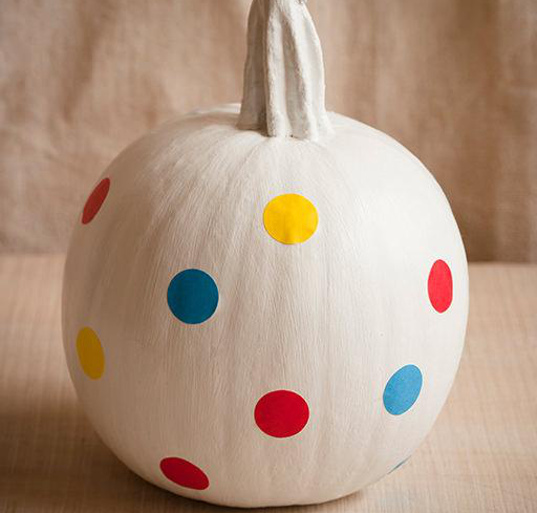 If you want to play with negative space for some mix and match, you can also stick dots of painters’ tape on your pumpkins and brush or spray paint them in a contrasting color. If your little one is a bit of a whiz at chalk art, or you would like to change your decorations a few times over the coming season, this project from Real Simple is for you. Use brush on or spray on chalkboard paint and then doodle to your heart’s content. Write messages, draw figures or patterns, or go for a more traditional jack-o’-lantern face. I’ll confess, this project is my favorite! The carving is simple and the possibilities are endless with this one. You can use your child’s plastic zoo animals, farm animals or dinosaurs, some plastic fish tank weed or train set vegetation, and even add glow sticks or a small nightlight for some moody back lighting. 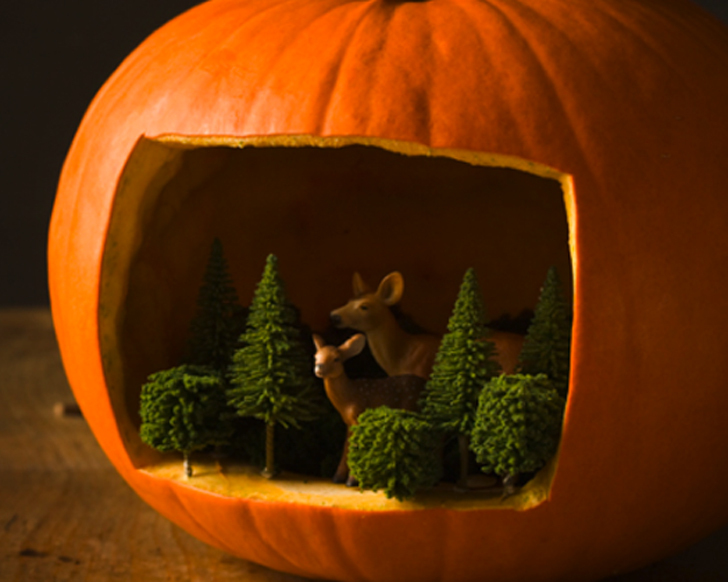 This beautiful diorama with its cute-but-kitsch ceramic deer is from Oh Lovely Vintage and might inspire you to get thrifting for your Halloween decor, but Sweet Paul also has a fabulous version which is featured in the lead image of this post. This is a kit from Hearth Song. The fun wooden accessories can be repositioned again and again by little decorators after a grown-up has helped make the initial holes. 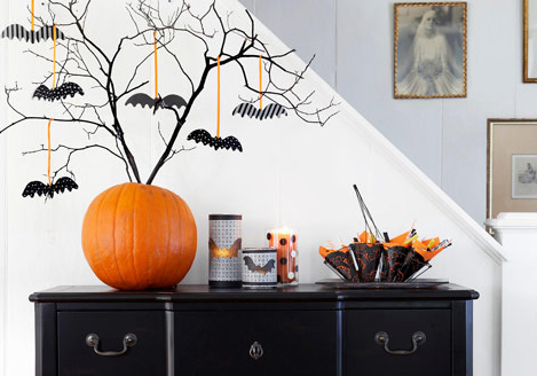 Once Halloween is over, simply clean, dry and store the wooden parts for reuse next year. This design from All You helps set the Halloween mood without being too scary for younger children. The carving is also super simple, and you can certainly apply paint with a brush rather than spray it on as stated in the instructions if young ones are going to be helping. 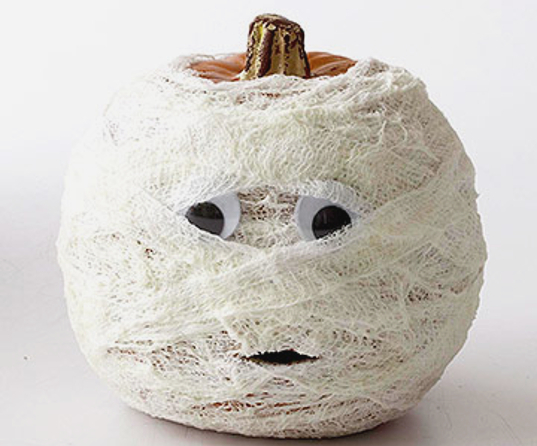 There are few wrapped mummy pumpkin projects around the interwebs, but this one from Better Homes and Gardens is even more fun for its use of glow-in-the-dark paint. Click through for the detailed, step-by-step instructions. Nothing says party like a bit of glitter, especially if you are around four years-old, right? This project from HGTV uses spray adhesive, but you can also use Mod Podge or similar if young ones want to lend a hand. Mix or match your glitter and pumpkin colors, coat the whole pumpkin or just the top for a dusted effect, or make dot or stripe patterns as in this project from Yesterday’s Sweetheart. This project from The SoHo is reason to love washi tape number 53, right there! The bold, graphic patterns of the tape can be used on their own, or mixed and matched. Just snip to length and stick on for a contemporary-looking project that is simple enough for little fingers to manage. 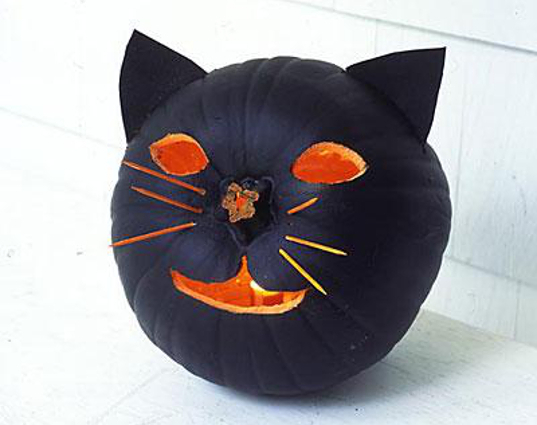 This is another pumpkin decorating project that probably works best on a white pumpkin. The metallic pens add some Halloween magic in this simple project from Paper & Stitch, and you could also try neon pens if your decor leans more towards brights, or if you’d like to add a black light to your display for added eeriness. Again, this Good Housekeeping project is easy on the carving. You just need to cut out a small circle at the top of your pumpkin and scoop out the seeds. Then get busy cutting, pasting, painting and tying to create a spooky tree full of bats. This would also work for little ping-pong ball and white tissue ghosts. I have to admit, I have a soft spot for that deer! 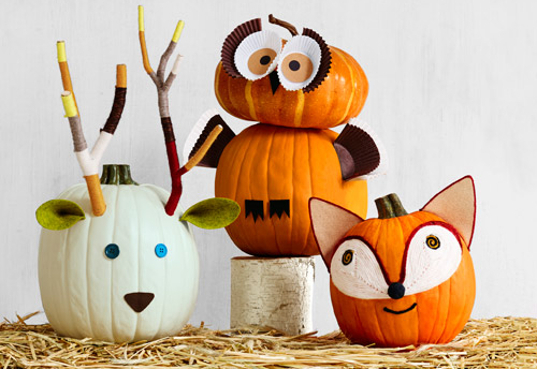 These cute as a button forest animal pumpkins from Country Living are deceptively simple and you probably have the materials lying around in the kitchen or the craft box. There’s a little bit of drilling and a little hot-glue action involved with these, but there are plenty of tasks suitable for little fingers to make it a project for everyone. So simple, so effective! For this project from Woman’s Day just grab a ball of parcel or kitchen twine and some plastic spiders and get wrapping. Fix the string with some well-placed pins or toothpicks if you want to keep it in place. 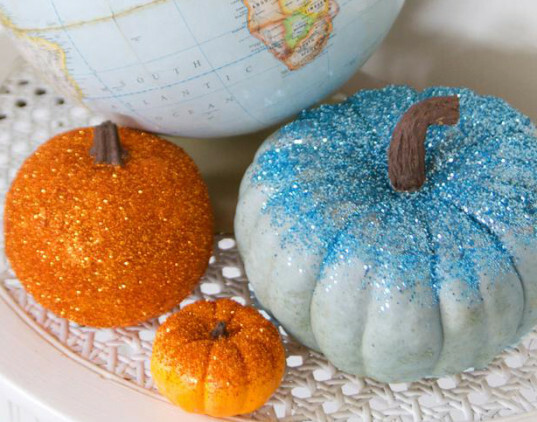 This is another simple, yet oh-so-effective pumpkin decorating idea. As with this project from Sweet Paul, you can simply buy rolls of colored dot stickers from the stationery store. Or you can get a bit more glam and cut out textured glittered adhesive pieces with a circle hole punch, as in another beautiful project from The SoHo. 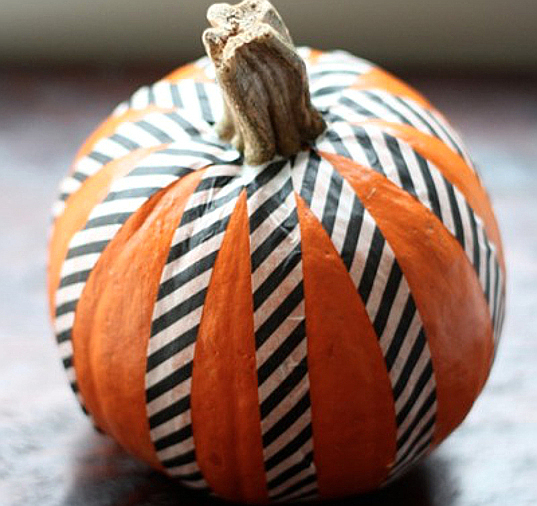 If you want to play with negative space for some mix and match, you can also stick dots of painters' tape on your pumpkins and brush or spray paint them in a contrasting color. 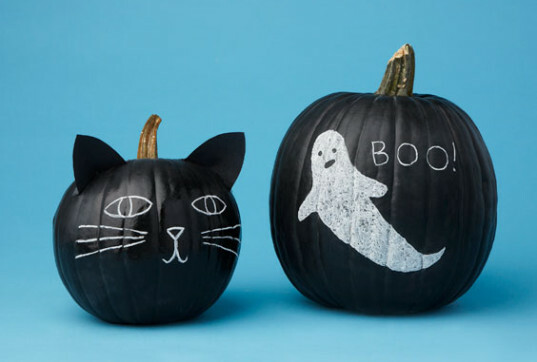 If your little one is a bit of a whiz at chalk art, or you would like to change your decorations a few times over the coming season, this project from Real Simple is for you. Use brush on or spray on chalkboard paint and then doodle to your heart's content. 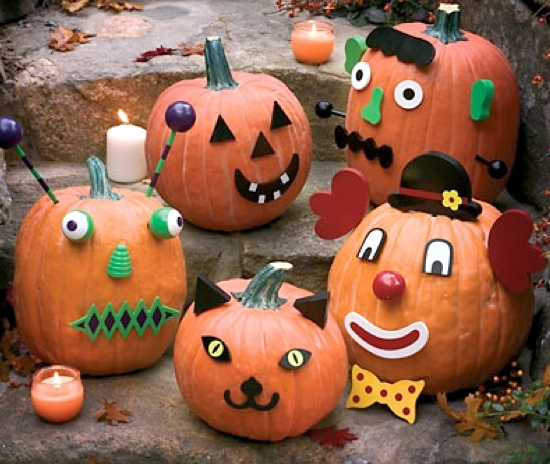 Write messages, draw figures or patterns, or go for a more traditional jack-o'-lantern face. I'll confess, this project is my favorite! The carving is simple and the possibilities are endless with this one. You can use your child's plastic zoo animals, farm animals or dinosaurs, some plastic fish tank weed or train set vegetation, and even add glow sticks or a small nightlight for some moody back lighting. 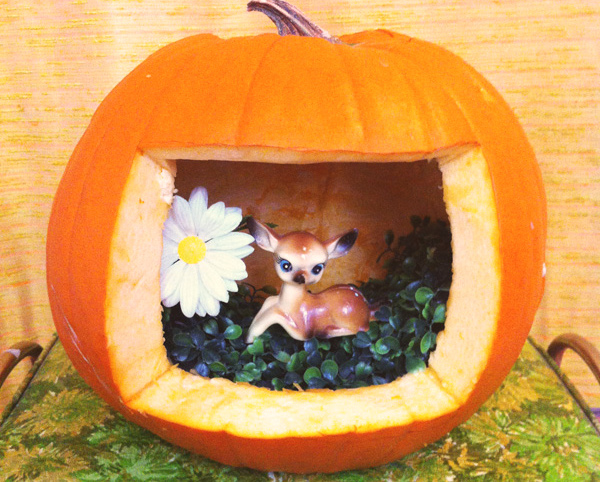 This beautiful diorama with its cute-but-kitsch ceramic deer is from Oh Lovely Vintage and might inspire you to get thrifting for your Halloween decor, but Sweet Paul also has a fabulous version which is featured in the lead image of this post. Nothing says party like a bit of glitter, especially if you are around four years-old, right? This project from HGTV uses spray adhesive, but you can also use Mod Podge or similar if young ones want to lend a hand. Mix or match your glitter and pumpkin colors, coat the whole pumpkin or just the top for a dusted effect, or make dot or stripe patterns as in this project from Yesterday's Sweetheart. This is another pumpkin decorating project that probably works best on a white pumpkin. The metallic pens add some Halloween magic in this simple project from Paper & Stitch, and you could also try neon pens if your decor leans more towards brights, or if you'd like to add a black light to your display for added eeriness. I have to admit, I have a soft spot for that deer! These cute as a button forest animal pumpkins from Country Living are deceptively simple and you probably have the materials lying around in the kitchen or the craft box. There's a little bit of drilling and a little hot-glue action involved with these, but there are plenty of tasks suitable for little fingers to make it a project for everyone. So simple, so effective! For this project from Woman's Day just grab a ball of parcel or kitchen twine and some plastic spiders and get wrapping. Fix the string with some well-placed pins or toothpicks if you want to keep it in place.